Second-year MSW student Katrena Dale and MSW May graduate Theresa Sprain were victims’ services interns at the Tuscaloosa District Attorney’s office this spring, where they completed individual assessments for victims and helped establish support groups for victims of domestic violence and for mothers and fathers during custody and child support hearings. 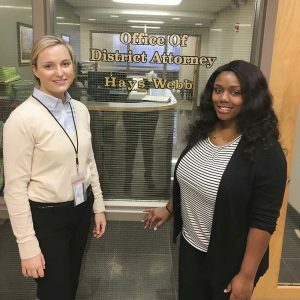 District attorney Hays Webb, who was elected in 2016, and Marilyn Anderson, victims’ services officer, were keen to strengthen the office’s communication and work with victims. Prior to the interns’ arrival, the DA’s office identified and contacted 1,800 victims of felony crimes who hadn’t received correspondence over a number of years, Webb said. Sprain and Dale helped identify 200 additional victims that weren’t identified in the office’s previous efforts. Dale and Sprain also provided additional courtroom support for victims of misdemeanor crimes by assessing victims’ needs, from establishing the first line of communication to connecting victims to services, to better deal with their circumstances.